History of Charter Quay riverfront and moorings, Kingston upon Thames. The history of Kingston is a history of boats and boat builders. With a bit of imagination, you can almost see Kingston Museum’s 900AD log canoe, being used to explore the inlets and reed beds of the Hogsmill river. The archaeological dig preceding the Charter Quay building works discovered history laid upon history, and all of it bound one way or another to boats. Turks, a local boat builder and operator, have been crafting vessels since Kingston was established as a town in the 12th century. 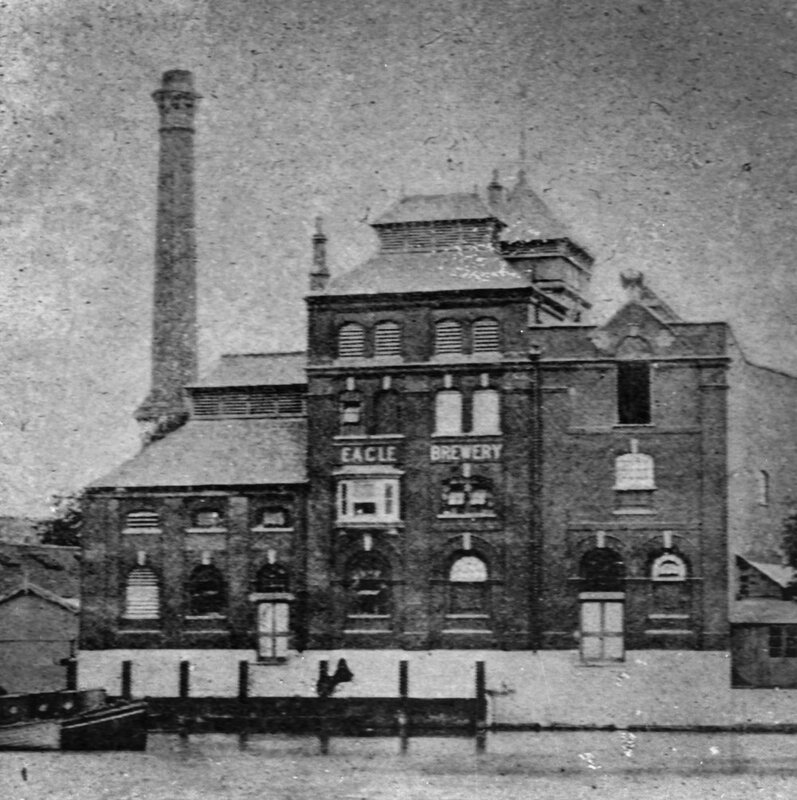 The Kingston riverside they would have seen would be very different to the one we know today: Fricker’s Eagle Brewery at Fricker’s Eagle Wharf (shown left c1890); a timber yard (that had provided oak for the Palace of Westminster); a tannery (making good use of all that oak bark); and Burgoine’s boat building works. Alfred Burgoine’s racing yachts were said to be second to none, as were his centre board gigs (a shallow boat that can be sailed or rowed, particularly suited to the Thames). But Mr Burgoine was better with boats than money, and had to close his works in 1910. Various other boat builders and yacht clubs then occupied the site, including Sammy Emms from the 1930s to 1980. 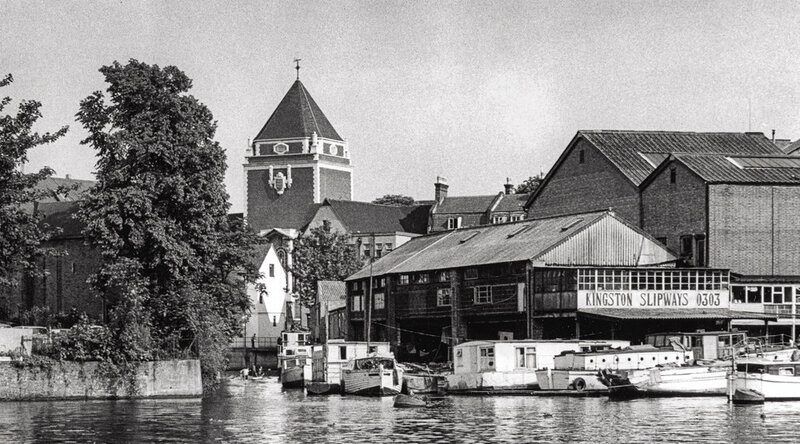 From the 1960's onwards, Kingston's riverside industries and businesses gradually closed or moved away. By the time the area was identified for development in the 1980s, it was run down and ex-industrial, albeit with a vibrant community of houseboats. In the mid 1990's a court case brought by St George Ltd (the company chosen to develope the area) confirmed that the houseboat owners also owned the freehold to much of the former Sammy Emms boatyard site. The Royal Borough of Kingston and St George Ltd gave the boaters a choice between compulsory purchase, or being allowed to stay permanantly in return for giving up their freehold interest. The boaters chose the latter. Of the 32 boats on the site at the time of the transfer, eight were given residential moorings along the riverfront. After CQRA Ltd gained the head lease from St George Ltd in 2013, those eight moorings were the only properties at Charter Quay still managed by the developer. When CQRA Ltd gained the freehold in early 2017, their help finally enabled the boaters to become a self-managed community. The moorings are now run by the boaters through a non-profit making company, Charter Quay Moorings Limited (CQML), with a volunteer board. The Charter Quay moorings are directly licensed from the environment agency to Charter Quay Moorings Limited (CQML). CQML is the company that acts on behalf of the residential boat owners moored at Charter Quay. CQRA Ltd authorises CQML to have the licence with the environment agency. 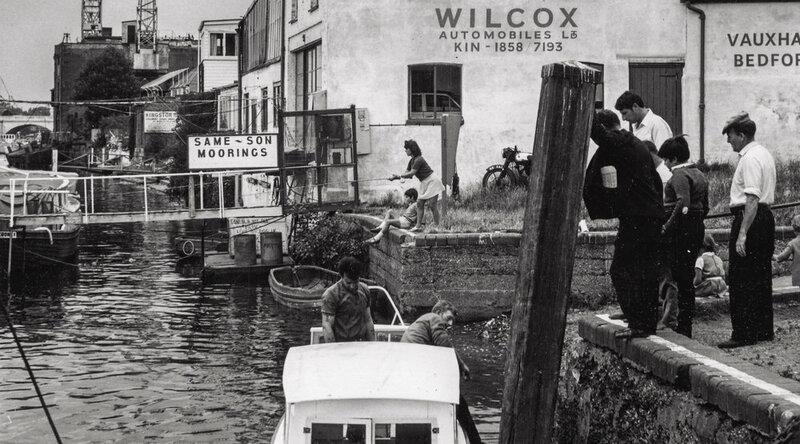 Kingston's riverfront by the Hogsmill c1970.. In addition to the residential moorings, both the Environment Agency and the Royal Borough of Kingston stipulated that Charter Quay also have a visitor mooring as an asset to Kingston and the Thames. It is situated in front of the Town Houses and Brown’s Brasserie. St George Ltd had long neglected the visitor moorings which resulted in a number of boats permanently moored there without being charged or moved on. In order to gain management of the residential moorings, Charter Quay Moorings Limited had to take on responsibility for (and financially subsidise) the visitor moorings, with the Environment Agency setting the conditions for use to ensure the mooring is welcoming to all. From the first day CQML had responsibility for the moorings, Thames Visitor Moorings Ltd has been collecting fees and ensuring all visitors abide by the Environment Agency rules. Thames Visitor Moorings Ltd is a company the Environment Agency use to manage their own moorings, and CQML have chosen to use them too. The tradition of boats on the river at Kingston is still going strong. From centenarian Dutch barges, to a traditional tug boat and a Kingston-in-Bloom prize-winning narrowboat, to the Turks party boats; the 150 year old Kingston Rowing Regatta; the commercial narrowboat delivering coal; heavy construction boats towing equipment to repair locks and river banks; sailing dinghies from the Minima Yacht Club; paddleboards, canoes and kayaks. And still the occasional wooden camping skiff, perhaps laden with enough fruitcake and tinned pineapple to get them to Oxford. In modern times: The Royal barge Gloriana attends Kingston's historic Regatta, the oldest regatta in the UK, established in 1857. - Charter Quay as a name is relatively recent. It was created for the Prudential Assurance Company when they had intended to build offices on the site in 1988. - Although there has been a passage from the Thames to Kingston High Street since medieval times, when Charter Quay was built Emms Passage was moved to its current position and was probably named after Sammy Emms, who owned a boatyard on the Charter Quay site between the 1930s and 1980. - Clattern Bridge, the 12th century bridge that crosses the Hogsmill, was reputedly named for the noise of horses hooves and iron-clad wheels crossing it. - The name of the Charter Quay river front, ‘Palmers Wharf’, comes from G.J. Palmer and Sons who used Eagle Wharf, amongst others, to unload seacoal brought directly from the northern collieries, from the 1920s to the mid 1960’s. Historic black and white photographs courtesy of Kingston Museum.